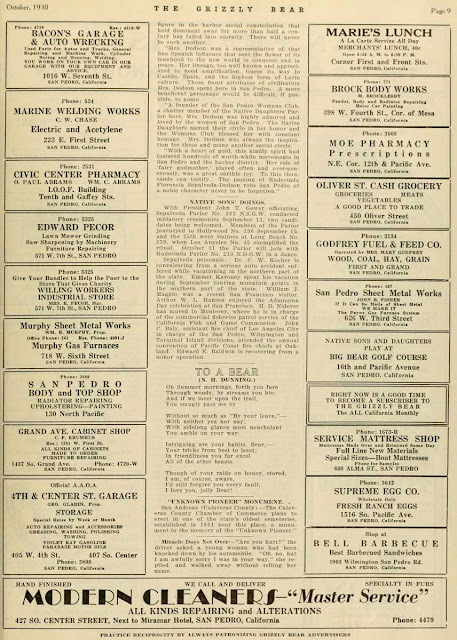 The following clippings are from the January 1930 issue of the Grizzly Bear, then the house organ of the Native Sons and Daughters of the Golden West (NSGW and NDGW)—a fraternal organization founded by General A. M. Winn on 07/11/1875 with “parlors” (rather than “lodges”) throughout California. Each parlor had both a name and number. 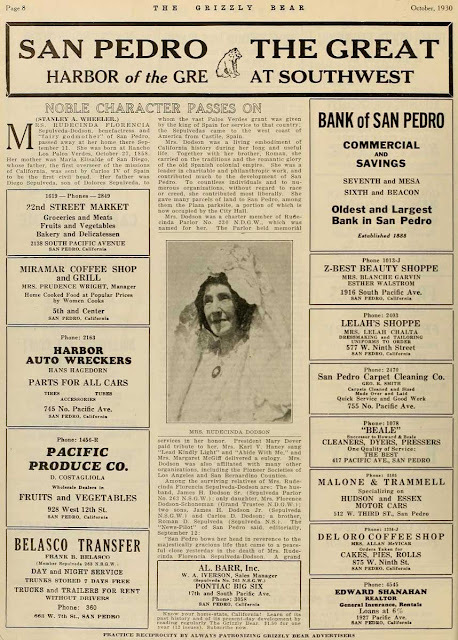 The San Pedro parlors were the Sepulveda (named after Ramon D. Sepulveda), NSGW No. 263, and the Rudecinda (named after Rudecinda Florencia Dodson nee Sepulveda, 10/27/1858-09/11/1930), NDGW No. 230. 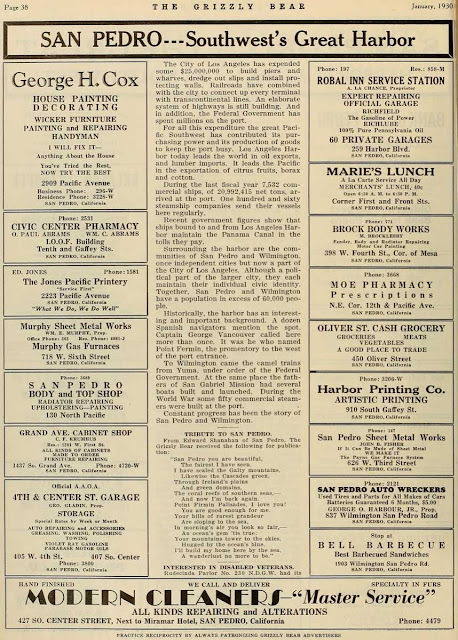 Both parlors met at the IOOF (International Order of Odd Fellows) Temple located at the corner of 10th and Gaffey (the building still stands sentry kitty-corner to the library parking lot—but the “Civic Center Pharmacy” on the ground floor is long gone). The Sepulveda parlor met every Friday and the Rudecina met on the 1st and 3rd Thursday of each month. Neither San Pedro parlor is currently active, though the Grand Parlor laid the cornerstone of the Municipal Building on 02/22/1928 and dedicated the then “Richard Henry Dana Junior High” on 04/27/1928. 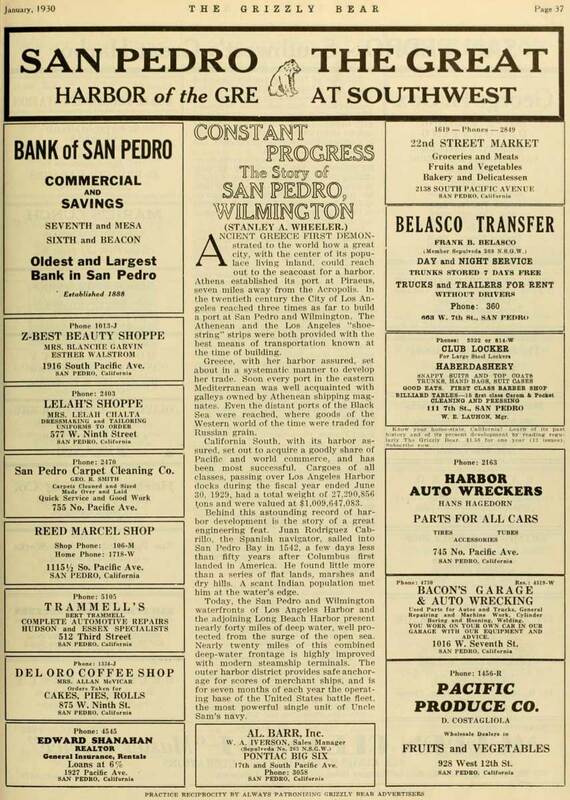 The first clipping includes is a brief article by Stanley A. Wheeler (“Constant Progress: The Story of San Pedro, Wilmington”) with a rhapsodic ode to Point Fermin Palisades by realtor Edward Shanahan—but mostly I enjoy the ads for various local business and the 3-4 digit phone numbers. 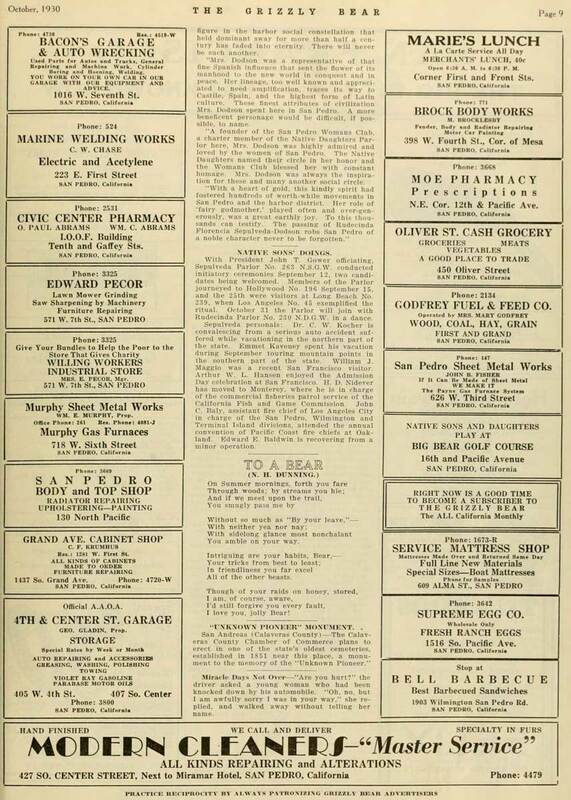 We still had our local grocers, dairies (“creameries” with locally made ice cream), pharmacies and banks instead of giant national and multinational corporations. 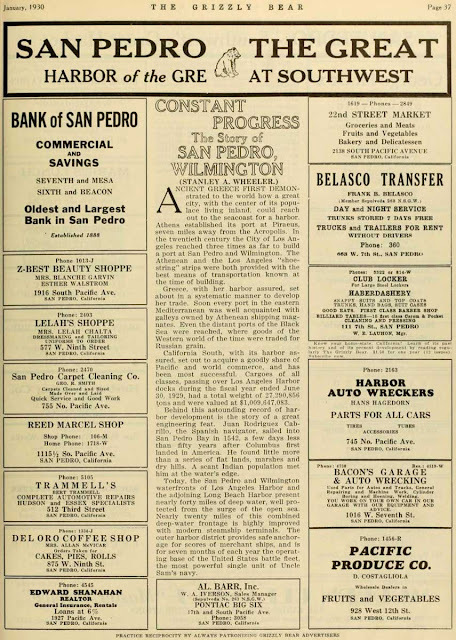 The “Oldest and Largest Bank” in town was the Bank of San Pedro (established in 1888) with 2 branches—just 3 blocks from each other. I can’t help wondering, though, how many of the businesses survived the decade of the Great Depression. 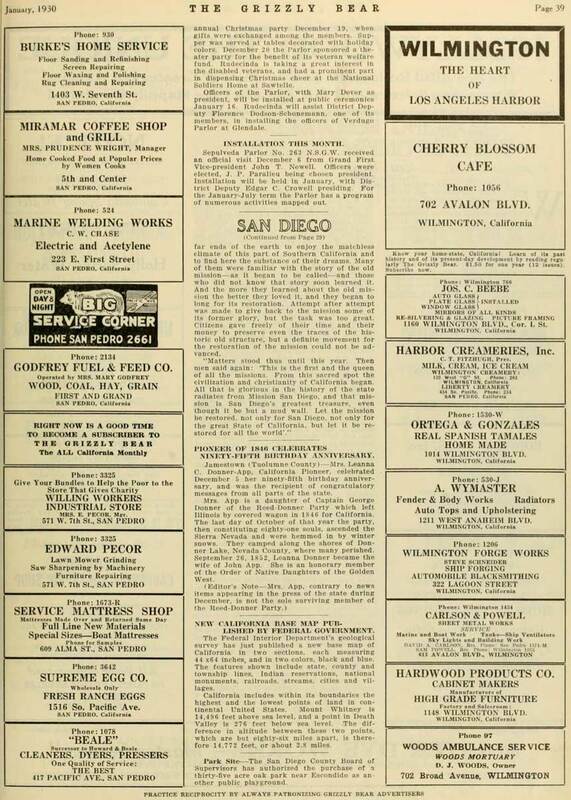 I wonder most about Marie’s 40-cent Merchants’ Lunch at 1st and Front Street, the “Home Cooked Food at Popular Prices by Women Cooks” at the Miramar Coffee Shop and Grill, and the “Best Barbeque Sandwiches” at 1903 Wilmington San Pedro Road (now that’s an original name for the road connecting San Pedro and Wilmington). I also find intriguing that we were the largest exporter of oil in the world, yet the Robal Inn Service Station on Harbor Blvd. featured “100% Pure Pennsylvania Oil” (that’s like a gas station in Saudi Arabia advertising 100% Texas oil). Today there’s not much demand for coal, hay, or same day mattress makeovers, but one thing hasn’t changed in over 80 years—San Pedro was and is a car town. 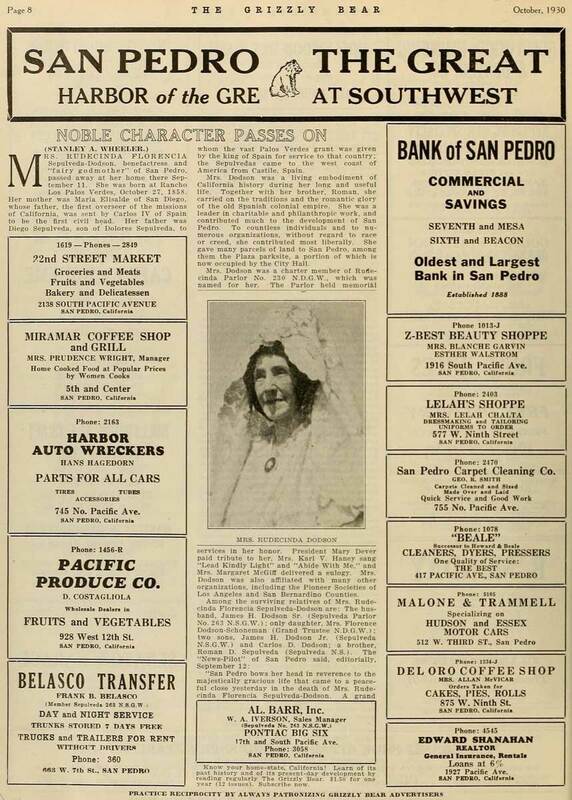 The second clipping is more somber, with Stanley A. Wheeler’s memorial (“Noble Character Passes On”) to the beloved matriarch of San Pedro, Rudecinda Florencia Dodson nee Sepulveda, 10/27/1858 – 09/11/1930. Rudecinda was the sister of Román Dolores Sepúlveda, daughter of José Diego Sepúlveda and María Francisca Elisalde, granddaughter of José Dolores Sepúlveda (grantee of Rancho de los Palos Verdes) and María Ignacia Marcia Ávila, wife of James H. Dodson (Sr.), and the mother of Florence Schoneman nee Dodson, James H. Dodson (Jr.), and Carl D. Dodson. She was well known for her philanthropic works and donations to San Pedro—including the land along the Beacon Street bluff which formed the original Plaza Park (it was reduced to a sliver by the Harbor Blvd. 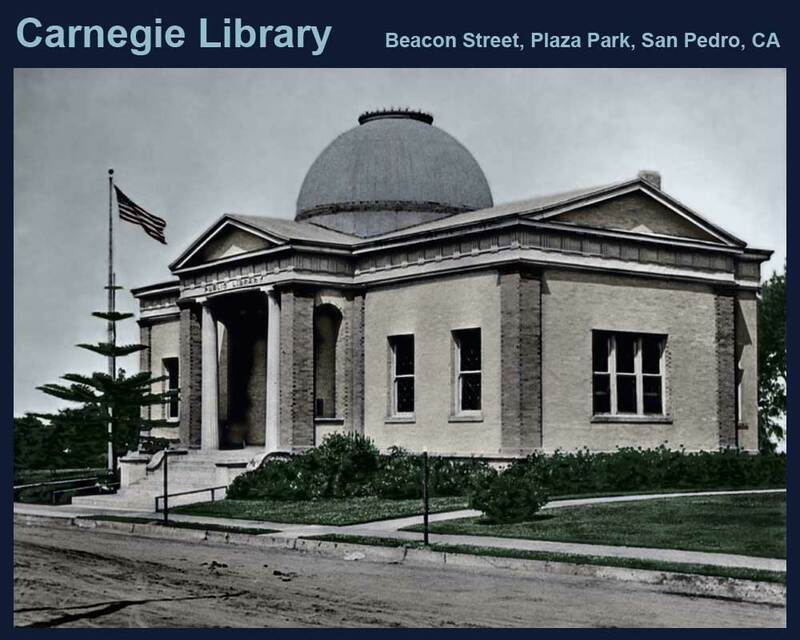 cut and is now undergoing a $5 million makeover) where San Pedro’s dual domes were constructed (the Carnegie Library and the City Hall) and where the promenade had a commanding view of the bustling harbor. Her home, the Dodson House (Los Angeles Historic Cultural Monument No. 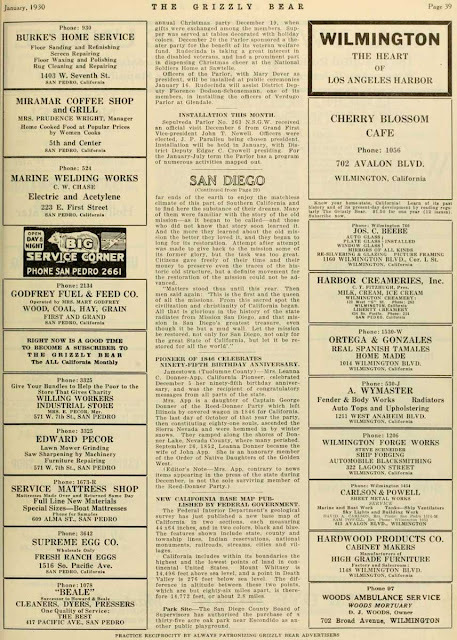 147) was built by the Sepulveda family as a wedding present, and has been a San Pedro landmark ever since (though now well removed from its original location at 7th and Beacon—even the bluff on which it sat has disappeared). Her partially hidden name graces the densely shaded mausoleum that peacefully greets visitors at the entrance to San Pedro’s 1st cemetery (founded in 1883 and now called the Harbor View Memorial Park).